These sweet, crumbly, so tasty treats are made traditionally at Christmas time in Greece but, truth be told, I make them all year round. 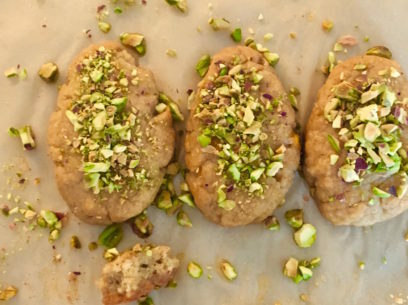 It’s so quick and easy to whip up a batch, finikia may just become your go-to Greek vegan cookie! A few simple ingredients are all you need and they’re all things you probably have in the kitchen right now. Bonus, the dough keeps refrigerated for up to two weeks in case you want to bake a quick panful when friends drop in. The syrup can be made with either honey or agave nectar and is authentically flavored with cinnamon stick and orange peel. 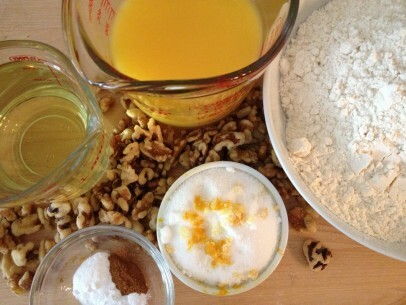 Sprinkle with chopped walnuts and try not to eat them all at once! There are a few quick tips to keep in mind to ensure a perfect batch each time. First, combine the wet ingredients in this exact order: dissolve sugar and orange zest in the orange juice, then drizzle in the vegetable oil whisking at the same time to incorporate everything nicely. This is very important! Once you’ve incorporated the wet ingredients as directed above, in a separate bowl, mix 1/3 of the dry ingredients and 1/3 of the wet ingredients. 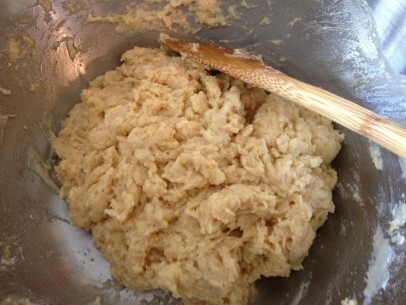 Combine well and continue adding by thirds until your dough has come together and pulls away from the side of the bowl. Be careful not to over-mix or your dough will be tough and your cookies dense. Finikia, or melomakarona, should be a light cake and just a bit crumbly. They’re done when the edges are just golden brown – careful not to over cook or you’ll be left with finikia that are dry as dust. Its best to dip them in the syrup while they’re still warm from the oven to soak up all the syrup flavors into the cookie. Also good is if the syrup itself is still warm when you’re dipping. About 30 seconds to a minute in the syrup for each side should do the trick nicely. Save the extra syrup to pour over your finikia once they’re plated. This recipe makes 2 dozen finikia and can be easily doubled. If you prefer a sweeter cookie, add up to another 1/4 cup of sugar to the recipe here. I like a less sweet cookie because the syrup sweetens them perfectly for my taste. My father likes a sweeter cookie and sometimes likes to have them syrup-free with coffee for breakfast. Any way you choose to enjoy them, you won’t be disappointed! Combine dry ingredients in medium bowl. Set aside. Combine wet ingredients in large bowl. 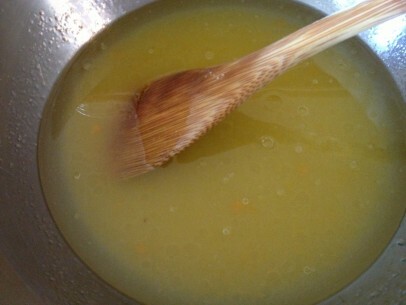 Dissolve sugar in orange juice then drizzle in vegetable oil while whisking to incorporate WELL. Add dry ingredients to well and mix well until all ingredients are combined and you have a soft dough. Do not over mix or knead as cookie dough will be tough. Allow dough to rest for at least 15 minutes. Using a 1/4 cup scoop, divide 1/4 cup scoop of dough into 2 pieces and roll between your hands into a sausage like shape. Lay on pan and press down gently until cookie is a little less than 1/2″ thick and oblong in shape (like the shape of an egg but flat). This recipe makes 3 dozen cookies. Bake at 350 degrees for 20-25 minutes until edges are just golden brown. Remove from pan and dip in syrup. While finikia are baking, combine all syrup ingredients in a medium saucepan over medium low heat for approx. 10 minutes stirring occasionally to incorporate. Taste as it’s cooking to see if you prefer a bit more honey/agave or a bit more orange juice. In summer, I like a lighter, more citrussy syrup. In winter, I find myself using more honey and cinnamon and less orange juice. Remove from heat and dip cookies in syrup while both cookies and syrup are still warm. Sprinkle with chopped walnuts or pistachios. Kali Orexi! Why do the photos of the cookies vary? Top photo looks like all the melomacarona I grew up with. The other pictures of the cookies are like drop cookies and look nothing like what I remember? I would love a recipe that produced the cookie in the top picture.Thanks. 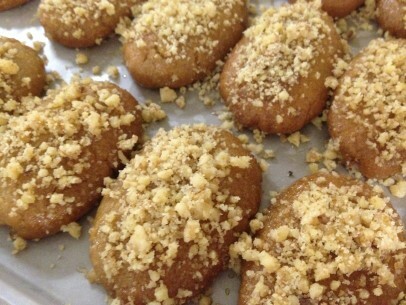 I always thought finikia were “stuffed” with nuts, and melomakarona were the unstuffed cookies. But here (in Anaheim, CA), the labels are used interchangeably. Either way, they are delicious!